Home » How Many Stomachs Does A Horse Have? Do horses have four-compartment stomachs like cattle? The answer is no. So, How Many Stomachs Does A Horse Have? The horse has one stomach that works much like a human’s. The horse is a non-ruminant herbivore, meaning horses do not have multi-compartmented stomachs as cattle do. The stomach of the horse is small to the size of the animal and makes up only 10% of the capacity of the digestive system or 9-15 liters in volume. The natural feeding habit of the horse is to eat small amounts of roughages often. Depending on how you feed the horse, the passage time of feed through our equine friends is highly variable. It takes only 15 minutes for the herbivore to consume a large meal. In the case of fasting, it will take 24 hours for its stomach to clear. Horses’ stomach has three main areas: the saccus caecus region, the fundus region, and pyloric regions. Each area is unique in structure and function. >>> Read more: Are Horses Ruminants Or Non-ruminants? The saccus caecus region locates at the entrance of the stomach and the esophagus. When food enters the stomach, it begins to come under the influence of hydrochloric acid and pepsin protein-digesting enzyme. The former helps break down solid particles and the latter digests proteins. As the feed moves through the stomach, the next section of the stomach is the fundus region. The pH level decreases to around 5.4 and fermentation begins to halt. Pepsin and stomach acid initiates the digestion and degradation of lipids (fats) and proteins (amino acids). The final section of the stomach is the pyloric region where the stomach joins the small intestine. The pH drops further to 2.6 which virtually eliminates all fermentable lactose-bacteria. The proteolytic activity (protein digestion) in this area is 15-20 times that of the fundus region. When feeding horses, you should provide the horses with six basic nutrient categories: carbohydrate, protein, fat, vitamins, minerals, and water. Feed companies will balance the first five nutrients for us; however, it is critical not to forget about water. A healthy horse will consume 5-15 (or more) gallons of water per day depending on temperature, humidity, and activity level. Ideally, clean water should be available at all times for the horse to drink when it is thirsty. If this is not possible, horses should be watered a minimum of twice daily and allowed several minutes to drink each time. Along with providing your horse with enough water, you can feed them lettuces, one of the great vegetables which also contain a lot of water. Horses that do not drink enough water are more susceptible to conditions such as dehydration, intestinal impactions and other forms of colic. The rest of the horse’s diet should be formulated based on its requirement for each of the other five nutrients. These requirements differ from individual to individual. There are some criteria to choose the feed like the horse’s body mass, age, workload, and metabolic efficiency. Please remember to look carefully at a feed tag and determine if that feed is going to meet your horse’s requirements. >>> Read more: Can Horses Thow Up? Here are five fascinating facts that will help you learn more about the equine’s metabolism. We’ll begin at the mouth and go all the way down! Fact 1: Horses can only chew on one side of their mouth at a time. They do this with an outside-to-inside motion on a slant, which is determined by the slant of the matching surfaces of the upper and lower cheek teeth. 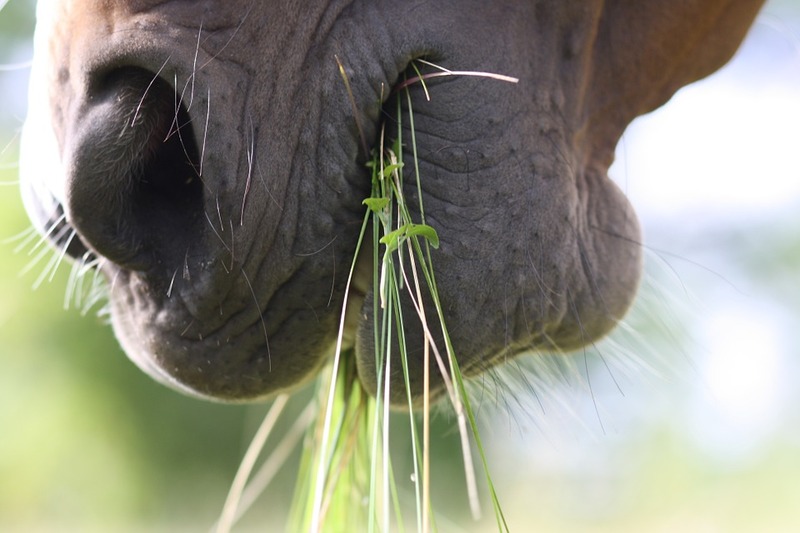 Fact 2: The horse can produce up to ten gallons of saliva per day if allowed to eat plenty of forage. Fact 3: The horse’s esophagus only works in one direction. The esophagus empties into the stomach. Food can go down, but cannot come back up. That’s why horses can’t vomit. Fact 4: The horse’s stomach can only hold about two gallons. Fact 5: Food only remains in the horse’s stomach for around 15 minutes. Unlike cattle (cows, bulls, oxen), horses have only one stomach for digestion. Their stomach has three main areas: the saccus caecus region, the fundus region, and the pyloric region. In terms of horses’ nutrition, carbohydrate, protein, fat, vitamins, minerals, and water are six fundamental elements. You should keep in mind these nutrients to feed your equine friend better. The horses’ digestion also contains many fascinating facts. For example, horses can only chew on one side of their mouth at a time. Or the horse’s stomach can only hold about two gallons. Should you find this article is helpful, please rate five stars and share this knowledge with other horses’ owners.